This post is in three parts: i) it provides a broad overview of the topic; ii) the authors review the major research findings linking low-frequency noise and infrasound from industrial wind turbines with effects on health and quality of life; and iii) a discussion about the relationship between various health effects and the processing of infrasound by the ear and brain. Cary Shineldecker was skeptical about the wind project the Mason County, Michigan, planning commission was considering for approval. His home, two miles from Lake Michigan, was located in an area where night-time noise levels were around 25 dBA, with only occasional traffic and seasonal farmland noises. The rolling hills, woodlots, orchards, fields, and meadows surrounding his property contributed to its peaceful country setting. He voiced his skepticism about the wind turbines repeatedly in community meetings held before Consumers Energy was finally granted approval to construct 56 476-foot turbines, one that would be 1,139 feet from his property line, six within 3,000 feet, and 26 close enough to be visible from his property. Cary and his wife, Karen, started to suffer symptoms of ear pressure, severe headaches, anxiety, irritability, sleep disturbance, memory loss, fatigue, and depression immediately after the turbines began operating. Gradually, as sleep disturbance turned into sleep deprivation, they felt their home was being transformed from a sanctuary to a prison. Deciding to sell their home of 20 years, they put it on the market in March 2011, and it has remained unsold for 3-1/2 years. For the past year and a half, their nightly ritual has been taking sleeping medications and retreating into their basement to try to sleep on a corner mattress. The Shineldeckers received few offers to buy their home, and recently accepted an offer that would mean a substantial financial loss. They are scheduled to go to trial against Consumers Energy, and if their case goes to settlement without a trial, they will likely be forced into a confidentiality agreement about their case. Similar complaints of adverse health effects (AHEs) associated with living near utility-scale wind turbines have become commonplace in the U.S. and other developed countries. Energy companies in the U.S., motivated by lucrative tax subsidies available for developing wind resources as a form of green energy, are pushing aggressively to install more wind turbines, typically locating them near residential properties. Many rural residents now have one or more industrial machines that stand over 40 stories tall on the property alongside their home. Complaints about noise from people living within the footprint of wind energy projects are very similar to those experienced by the Shineldeckers. Those who have never visited a wind project or who visit one only during the daytime often leave believing that the complaints of noise are unfounded, and commonly assume them to be psychologically motivated or a form of NIMBYism . Those living near wind turbines say that unless one is willing to spend several nights in the area they have not experienced the noise that causes the complaints. Prior to the installation of the wind turbines, these rural communities were typically very quiet at night, with background sound levels ranging between 20 and 25 dBA. After the turbines began operation, the noise levels jumped to 40 or even 50 dBA, and sometimes higher. It is common for wind turbines to be barely audible during the day, yet be the dominant noise source at night. Environmental sounds are quieter in the evening, lowering the background sound levels, and wind speeds tend to be higher at blade height during nighttime hours, which increases sound emissions. Further, nighttime weather conditions enhance sound propagation. The result is that at night wind turbines can be a significantly more noticeable noise source than during the daytime. Commercial wind turbine blades produce aerodynamic noise in both the inaudible and audible range, collectively referred to as infrasound and low-frequency noise (ILFN). Although some of the audible noise is above 200 Hz, much of it falls into the low-frequency region around 0-100 Hz. Infrasound, generally considered to be inaudible, encompasses sound energy in the range from 0-20 Hz. It is measureable with either an infrasonic microphone or a microbarometer. 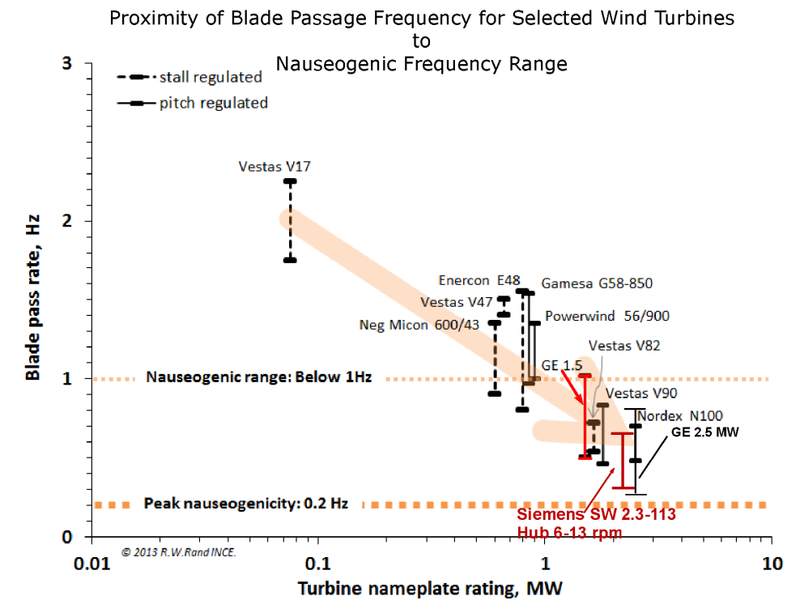 The frequency and amplitude of wind turbine noise depend mainly on the blade-rotation speed. Measurements show increased acoustic energy with decreasing frequency, reaching a maximum at frequencies under 1 Hz. 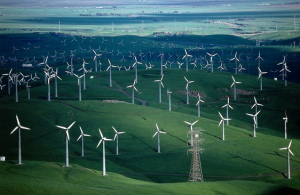 Promoters of wind energy frame it in agricultural terms that portray it as harvesting the wind. This framing leads to the belief that wind farms are a natural fit with agricultural land use. 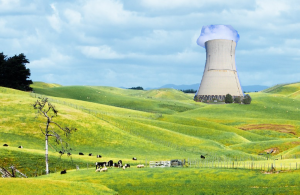 From this viewpoint, farmers should also be allowed to use their land to harvest the energy of the atom by hosting a small nuclear plant. Hosting a utility-scale wind turbine is not farming; it is operation of a commercial utility. The installation of utility-scale, energy-conversion machines requires strict zoning and regulation, as one would expect for a zoned industrial region. These machines are in no way similar to traditional agricultural equipment. Thus we consider the term industrial to be an accurate description of utility-scale wind turbines. Wind turbines are often sited in regions where agricultural land use is intermixed with residential land use. A single wind energy utility typically consists of 40 to 60 wind turbines. Forty-five 2-MWatt turbines cover about 36 square miles of land. This requires only 10 to 20 farmers to sign leases for hosting one or more of the turbines, but may put several hundred non-participating farms and residential homes within the risk zone for noise disturbance. While a few farmers or landowners in the host community benefit financially, many others—often at ratios of 20 to 1 or higher—find that the peace and quiet of evenings and nights that attracted them to the rural community is replaced with the unwanted consequences of audible sounds and inaudible infrasound. Evidence that industrial wind turbines (IWTs) negatively impact human health is vast and growing. Although that evidence acknowledges that the exact exposures needed to impact health and the percentage of the affected population are still unknown, there is indisputable evidence that adverse health effects (AHEs) occur for a non-trivial percentage of exposed populations. Here, we give an overview of that evidence. Wind turbine noise is not known to cause hearing loss. Interestingly, though, individuals who have hearing disorders may be more susceptible than persons with normal hearing to AHEs from wind turbine noise, and people who are deaf can suffer the same ill effects as those who have normal hearing when exposed to wind turbine noise. The latter finding supports the view that infrasound, not just the audible whooshing, low-frequency noise emitted by wind turbines, is the cause of many of the health complaints. The anecdotal evidence, documented on internet blogs, in newspaper articles, in expert testimony in legal proceedings, and recently in the documentary movies Windfall and Wind Rush, is compelling and illustrative of the similarity in symptoms. These adverse symptoms appear when people are exposed to operating wind turbines, and disappear when the turbines stop operating. These observations resemble single-subject research experiments, in which individuals serve as their own controls while being subjected to alternating conditions or treatments. Dr. Carl Phillips, a noted epidemiologist, describes the use of adverse event reporting as a first step in establishing the existence, prevalence, and spread of a variety of health conditions, as well as adverse reactions to such agents as medications and environmental pollutants. Reports that many families abandon their homes after IWTs begin operation make the anecdotal evidence particularly compelling. Studies conducted in Denmark, the Netherlands, Germany, and Sweden, where residents have many decades of experience with IWTs, collectively indicate that wind turbine noise differs from and is more annoying than other sources of noise, including community, transportation, and industrial sources. These differences are attributed to the substantial infrasound and low-frequency noise (ILFN) produced by the turbines. Such sounds are not easily masked by other environmental sounds, including wind noise. As the blade passes the tower, infrasound pulses are emitted, while more audible low-frequency sounds are produced by blade movement. Used by permission of Esther Wrightman, Ontario. Annoyance from turbine noise at 35 dBA corresponds to the annoyance reported for other common community-noise sources at 45 dBA. The World Health Organization (WHO) has concluded that observable effects of nighttime, outdoor noise levels of 40 dBA or higher will lead to diminished health. This also occurs when levels inside homes (especially bedrooms) rise above 30 dBA or contain non-steady and/or low-frequency noise. Yet, the wind industry commonly promotes 50 dBA as an appropriate limit for homes, even though the World Health Organization has identified such high levels as a cause of serious health effects. Sleep disturbance is by far the most common complaint of families living near wind turbines. Prolonged lack of sleep affects our capacity to learn and negatively affects our memory, temperament, heart health, stress levels, and hormones that regulate growth, puberty and fertility. It can also lead to high blood pressure, changes in heart rate, and an increase in heart disease, as well as weight gain and lowered immunity to disease. These symptoms have regularly been reported by individuals who live near IWTs. In a controlled clinical study, residents who lived within 1.4 kilometers, or 0.87 mile, of IWTs exhibited greater sleep disturbance and poorer mental health than those living at distances greater than 3.3 kilometers, or 2 miles, away, and scores on sleep and mental-health measures correlated well with noise exposure levels. Another study found lower quality of life (QoL) in residents living within 2 kilometers of a turbine installation than at longer distances. Abandonment of homes near wind turbines has been associated primarily with disruptions to sleep and QoL. Nina Pierpont, MD, PhD, a practicing pediatrician, coined the term Wind Turbine Syndrome (WTS) in 2009 to describe the symptoms she observed in a cohort study of 38 members of 10 families. Those symptoms include: sleep disturbance; headache; Visceral Vibratory Vestibular Disturbance (VVVD); dizziness, vertigo, unsteadiness; tinnitus; ear pressure or pain; external auditory canal sensation; memory and concentration deficits; irritability and anger; and fatigue and loss of motivation. Although her case-series report, published as a book, has often been maligned by the wind industry as being non-scientific, an increasing body of scientific evidence supports her observations and their links to exposure to wind turbines. Dr. Robert McMurtry, a well-respected Ontario physician, recently proposed specific diagnostic criteria for a case definition of AHEs due to IWTs. In 2009, a joint report of the American and Canadian Wind Energy Associations (AWEA/CanWEA) established the basis for arguments routinely used by wind energy advocates to persuade the public and public officials that IWTs present no health risks. The panel members who produced the report were handpicked by AWEA’s acoustical consultant, and all had prior positions on noise from wind turbines favorable to the industry. The report concluded that exposure to wind turbine noise has no direct adverse physiological or health consequences, a conclusion shown to be erroneous by multiple lines of evidence, at least several of which were established prior to the report. The report’s major weaknesses were its comparisons of wind turbine noise levels to those produced by other environmental noises and its embrace of the A-weighted measurement scale as valid, even though that scale minimizes low-frequency sound and completely excludes infrasound. Several scholarly researchers have rejected the AWEA/CanWEA report as misleading and unscientific. One of the report’s co-authors, Dr. Geoff Leventhall, whose own research demonstrates that ILFN leads to various health symptoms, attributes those symptoms to extreme psychological stress from low-frequency noise, but does not acknowledge that IWTs also cause such symptoms. 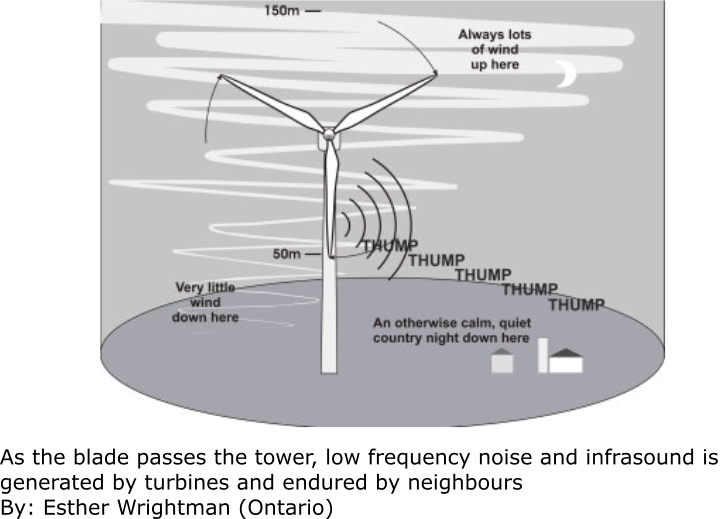 He argues that the ILFN emitted by wind turbines falls below the threshold of hearing, claiming that what we can’t hear can’t hurt us—a topic we will address in our final instalment. The relationship between various health effects and our current understanding of the processing of infrasound by the ear and brain. As noted in the second instalment of this series, Dr. Geoff Leventhall, a co-author of the 2009 AWEA/CanWEA report, attributes the health complaints of people who live near industrial wind turbines (IWTs) to psychological stress, but does not acknowledge that IWTs can be detrimental to health because infrasound and low-frequency noise (ILFN) emitted by wind turbines are largely inaudible to humans. He stands on the argument, therefore, that what we can’t hear can’t hurt us. Copyright © Hearing Health & Technology Matters, LLC. 2015. Articles may be republished with permission of the Editor of HHTM. Please read our republication guidelines before submitting your request. Jerry Punch is an audiologist and professor emeritus at Michigan State University in the Department of Communicative Sciences and Disorders. Since his retirement in 2011, he has become actively involved as a private audiological consultant in areas related to his long-standing interest in community noise. Richard James is an acoustical consultant with over 40 years of experience in industrial noise measurement and control. He is an adjunct instructor in Michigan State University’s Department of Communicative Sciences and Disorders and an adjunct professor in Central Michigan University’s Department of Communication Disorders.